Ideal for casual listening, relaxation, meditation and prayer, The Chants of the Holy Spirit features expert vocal performances and beautiful choir arrangements. Opening with the traditional tolling of the Angelus bell, this collection of Gregorian chants ushers in an intimate relationship with the Holy Spirit. Compiled from two masses for the Feast of Pentecost, the CD depicts the disciples waiting in the Upper Room, the rush of wind, the tongues of fire, and the spreading of the Gospel. Also featured are a reading of the Pentecost story from the book of Acts and Guillaume Dufay's Veni Creátor Spíritus. Performed by the Gloriae Dei Cantores Women's Schola, this CD is perfect for anyone seeking a more intimate connection with the Holy Spirit, from those who are new to Gregorian chant to seasoned scholars. Ideal for casual listening, relaxation, meditation and prayer, The Chants of the Holy Spirit features expert vocal performances and beautiful choir arrangements. Opening with the traditional tolling of the Angelus bell, this collection of Gregorian chants ushers in an intimate relationship with the Holy Spirit. Compiled from two masses for the Feast of Pentecost, the CD depicts the disciples waiting in the Upper Room, the rush of wind, the tongues of fire, and the spreading of the Gospel. 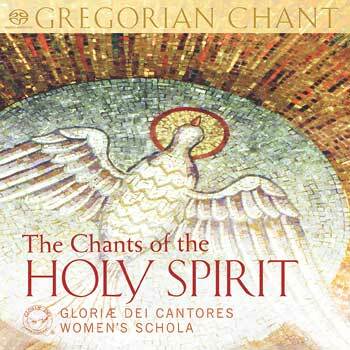 Performed by the Gloriae Dei Cantores Women's Schola, this CD is perfect for anyone seeking a more intimate connection with the Holy Spirit, from those who are new to Gregorian chant to seasoned scholars.